My name is Jennae Marie Cooper. Also known as J. Marie. I am a graduate of Tennessee State University. It has truly been an inspiration to write this book for young children. Working in the Early Childhood Education field as both a teacher and tutor for several years ignited my passion to write children’s literature. With a Bachelors degree in Psychology and a Masters degree in School Counseling, I began to see things from a psychological perspective and wanted children’s literature to be an enjoyable learning experience by sending subliminal messages with each storyline. In addition to being an author, I am a singing actor and a film producer. I enjoy performing in musical plays and overcoming what others say can not be done! There are several things that are not good for us, but instead we tend to bask in these forbidden pleasures anyway. The Candy Judge by J. Marie Cooper is a beautifully illustrated children’s story about the consequences of eating too much candy. 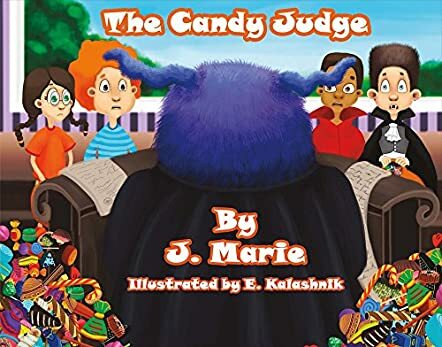 The Candy Judge is a fun, educational book that your child will not only love, but through it will gain an understanding about the dangers of eating too much candy. J. Marie Cooper does an excellent job in displaying how, if our children continue to consume too much candy, the effects on their well-being can be horrendous in the future. In The Candy Judge, parents and teachers alike becomes the secret agents for The Candy Judge. The Candy Judge sentences the child by banning the child forever from eating candy. I enjoyed reading The Candy Judge by J. Marie Cooper because it was not only engaging but entertaining, to say the least. It is a great book because it not only tells the story of what children of this country are struggling with, but it provides a funny solution, the banishment of candy for life. How cool is that? The two examples that J. Marie Cooper uses about the effects that candy has on teeth is key. Take Suzy for example; she ate so much candy during Halloween that all of her teeth fell out and Willie ate so much candy that all of his teeth had to be capped. Every parent must play a part in the health of their children. Will your child be banned for life by The Candy Judge from eating too much candy?